Almost unnoticed at the top of a hill just past the Oak St. Bridge in Waupaca's third ward sits one of Waupaca's historical landmarks -- the former Soo Line railroad depot. For much of the city's existence, the depot was an important part of the community. In 1907, after a fire destroyed the old building, the Wisconsin Central spared no expense to build the current structure for this important tourist and shipping location. The depot was the first thing travelers saw when arriving in Waupaca. It was a place for families to say goodbye or be reunited. Visitors could take a train to Waupaca or ride a trolley to the Wisconsin Veterans Home, Grand View Hotel, or boat dock where they could board a boat for their lake destination. Soldiers leaving for duty in both World Wars were sent off by their loved ones. Eventually times changed and, in January of 1965, Soo Line passenger service ended in Waupaca. The station continued to be used as an agent's office and section crew quarters until the new Wisconsin Central Railway purchased the railroad in 1987. Following the purchase, the once important building stood empty and deteriorating. 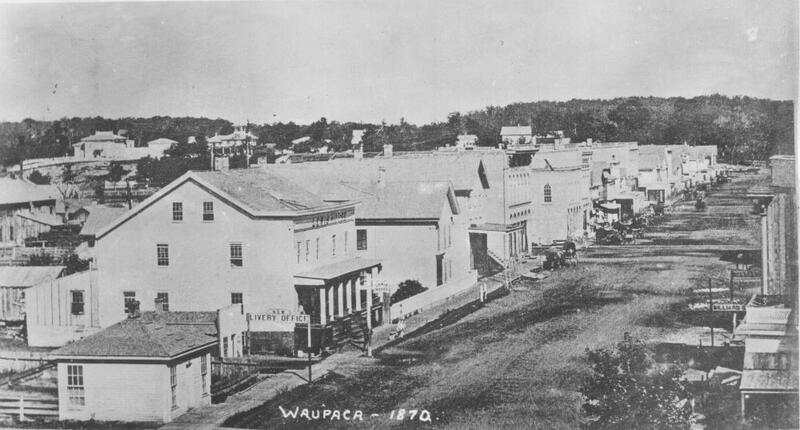 In 2004, after four years of careful negotiations with, first, the Wisconsin Central, and then the Canadian National Railroad, the Waupaca Historical Society was able to purchase the building without moving it off its current site. Many volunteer hours have been spent cleaning up the grounds and restoring the building.More work remains to be done, but with a group of dedicated workers, the beautiful stone Depot with its three fireplaces and Spanish tile roof is returning to its former grandeur. In 2015, volunteers dug out a basement below the Depot. This area now houses a G-scale model train display, featuring artwork of historic sites around the Waupaca and Chain O'Lakes area, a train table for little train enthusiasts. The Depot grounds also houses a car barn, which holds the baggage car from Waupaca's early trolley line. A caboose and Soo Line potato car also sit on the grounds for visitors to tour and view. The River Ridge Trail passes by the Depot along Oak St. and the granite quarry in Shambeau Park is just west of the depot grounds. A small trail connecting the Depot to the quarry has been built. Part of the connecting trail follows the old railroad siding that once served the quarry. In 2009, a car barn was built to house the baggage car from Waupaca's early 1900s trolley line. It is located at the bottom of the hill on the Depot grounds. If you wish to contribute toward restoration of the Depot, either financially or with your volunteer time, please contact the Waupaca Historical Society. We would also love to hear from you if you have Depot memories to share. The Depot is located at 525 Oak Street. It is open to the public, June through August, on Saturdays, Sundays and holidays from 12-5 p.m. and for special events. Tours of the Depot are available by appointment at other times by calling 715-256-9980.